A meeting held by the Russian unregistered opposition People's Freedom Party (“PNS”) in Moscow has failed to gather the planned 10,000 people, which, experts claim, proves that its leaders are unpopular among the population. 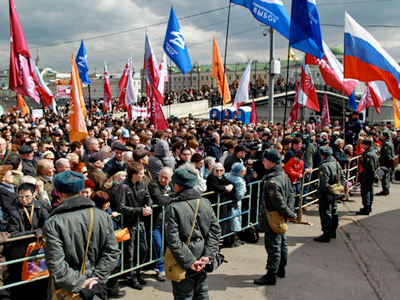 ­On April 16, the anti-Kremlin movement rallied on Moscow’s Bolotnaya (Swamp) Square against corruption and outrage and in support of free elections in Russia. The gathering was supposed to become the party’s presentation action and its leaders hoped to attract 10,000 supporters to the center of the capital. However, according to police, only about a thousand people, including 100 journalists, turned up. PNS, also known as Parnas, was founded last year by opposition politicians Mikhail Kasyanov, Boris Nemtsov, Vladimir Ryzhkov, and Vladimir Milov. To take part in the parliamentary vote in 2011 the party has yet to be officially registered by the Justice Ministry. 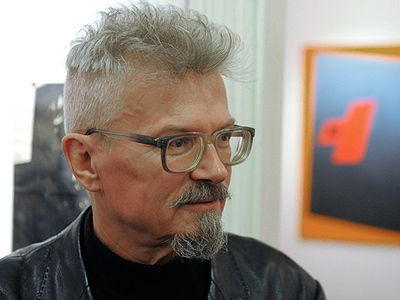 Each of its four co-chairs also heads his own political movement: Nemtsov – the Solidarity movement, Milov – Democratic Choice, Kasyanov – the People’s Democratic Union. Former State Duma deputy Ryzhkov is the leader of the Republican Party, which was denied registration in 2007. Yevgeny Minchenko, head of the International Institute of Political Expertise, believes that the main reason behind Saturday’s fiasco is the party's lack of organizational resources and absence of popular leaders who could manage to attract supporters, cited RIA Novosti. A popular blogger and journalist Maxim Kononenko agrees that Boris Nemtsov has been on the country's political scene for quite a while now and people are pretty tired of him. “That is why all his projects are hopeless,” he said, as cited by newspaper Nezavisimaya Gazeta (NG). Another expert, the general director of the Agency for Political and Economic Communications Dmitry Orlov, told NG that the problem is a lot more serious. “I think that the PNS has not got normal propaganda and financing structures that would provide for a realization of an all-Russian political project,” he said. They lack a network “for mobilization of supporters and activists”. The opposition leaders' inability to come to a compromise between them is yet another obstacle on the way to success. 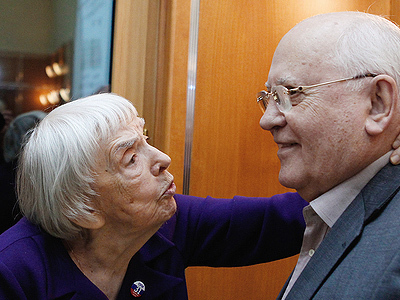 Parnas made a mistake when giving all its four co-chairmen the right to veto as in the case of disagreements this would block the work of the movement, Orlov observed. “I think that the fight for the leading roles in the organization will intensify as we get closer to parliamentary and presidential elections,” he added. Meanwhile, the co-founder of the new movement and one of the rally organizers, Vladimir Milov accused the media of lying about the number of participants at Saturday’s meeting. He wrote in his blog on LiveJournal that at least 7,000 supporters were in Bolotnaya Square and stated that they both have a “unique team” and “know-how on organizing mass rallies in the capital”. The politician vowed that more people would take to the streets in the future. Boris Nemtsov agreed with his comrade and said that the meeting was the opposition's most successful mass event in ten years. In an interview with NG, he also noted that the new party has already gathered 40,000 supporters' signatures out of the 45,000 required for the organization to be officially registered. 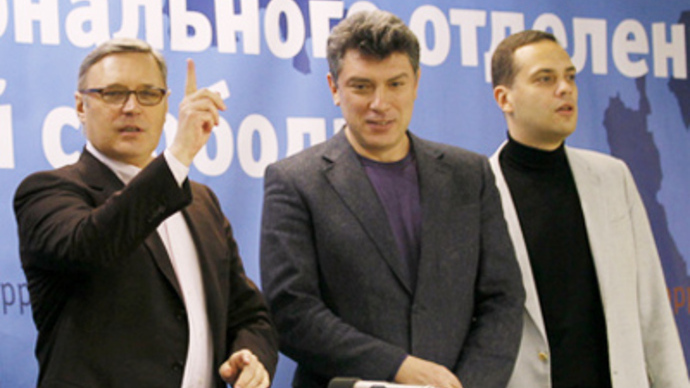 Nemtsov stated that Parnas will take part in the upcoming parliamentary election. Parnas’ “success” was overshadowed by a scandal over a spat between its members. Summing up the results of the Saturday rally, they exchanged accusations and rude comments on LiveJournal. According to Echo Moskvy radio station, Milov sharply criticized Solidarity movement members for violating earlier reached agreements. As a result of the bitter argument, Nemtsov's movement has demanded that Parnas’ leadership reacts to the incident. Otherwise, the opposition coalition might quit the party. Apparently, it was the money issue that became an apple of discord, as in a discussion thread between Milov and one of the Solidarity leaders, Sergey Davidis, the politician accused the movement of not contributing even a single kopeck for holding the opposition gathering. 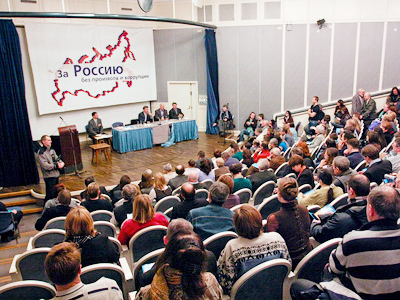 In the 2007 parliamentary election, no right-wing party managed to make it to the State Duma. Now the opposition leaders have decided to change their strategy and try to increase their chances by creating a coalition. In September 2010 they signed an agreement to found their new “Parnas” coalition. 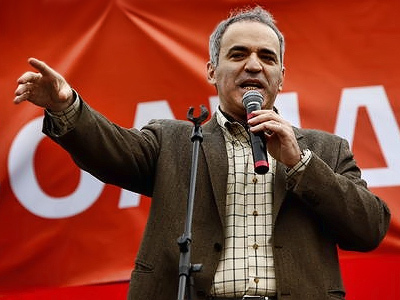 Its full name is People’s Freedom Party “For a Russia free of outrage and corruption”.